It’s Official! The Fabulous Team of Tom and Darryl Will Bring 2135 This Summer! Your favorite creative team (at least we HOPE it’s your favorite creative team) will be back in action to bring you KINGDOM COME 2135 in July! We’re not positive it’ll be called KINGDOM COME, but you get the idea. 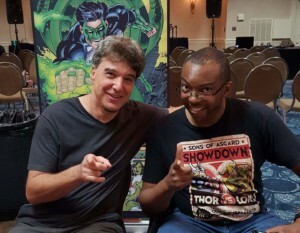 Tom and Darryl have worked together for so long now on CHAMPIONS OF THE GALAXY it’s hard to count the years, but Darryl has certainly surpassed past artists like Brian Michael Bendis and Chuck Carter in terms of longevity. It’s only going to get better! What happens next with GODSEND? Are MARAMUS and NIGHTMARE set to take over? If you’re not sure about the last reference, get with it! Get your copy of the KINGDOM COME: UPRISING expansion pack that was released in December. The names of Tom and Darryl are writ large alongside other legendary duos in history from Lennon and McCartney to Holmes and Watson, hey even Batman and Robin or peanut butter and jelly! Get psyched for the summer because Tom is busy plotting the next great expansion and Darryl will provide new amazing card drawings! When you add in coloring by Werner Mueck, presto—instant classic! ← Sherri Martel Another Legend Added to Ladies Roster!